A newcomer to Kelley Armstrong's Otherworld, so thickly populated with ghosts, demons, werewolves, necromancers, and other supernatural beasties, might be forgiven for wondering where ordinary people fit in. The title of Armstrong's latest supernatural thriller/romance, however, puts the answer to that question beyond all doubt. It's a bit of a spoiler, really, since—as the protagonist and narrator, celebrity spiritualist and real-life necromancer Jaime Vegas, mentions more than once—ordinary human beings can't perform magic in this world. Thus, any magic must perforce be either a sham, or performed by someone of supernatural heritage. On the other hand, given the large population of supernatural entities running around the Otherworld, this doesn't narrow down the field of suspects for a series of grisly murders by all that much. The novel opens on a homeless kid named Brendan, who's offered assistance by a friendly, nice-seeming middle-aged couple. This being the prologue to a supernatural thriller, the reader knows that things can't end well for Brendan, as indeed they don't. This, however, does not yet concern our protagonist, intent on giving her showbiz career a boost by appearing on a reality television series wherein she and two other spiritualists attempt to summon and communicate with various ghosts. Despite the immediate rivalry with her two costars, neither of whom has any real magical ability, Jaime looks on the whole enterprise as a lark—until it becomes clear that a quantity of ghosts is haunting the backyard of the house where the cast and producers are staying. Who these ghosts are and why they're there are the novel's core mysteries; as a necromancer, Jaime ought to be able to summon them up and ask them, but when she tries, she can't. Her spirit teacher, a ghostly dark-arts practitioner with the unlikely name of Eve, is unavailable, so the first third or so of the novel consists of Jaime and her maybe-lover Jeremy seeking out information while Jaime juggles her reality-show responsibilities. They contact journalists, debunkers, paranormal researchers, and witches, one of whom responds to Jaime's perfectly reasonable request by hitting her over the head and kidnapping her. Their investigations lead them up and down the West Coast, into magic shops and suspicious basements, and to question everyone (as well as everything) they meet. There's enough incident here to make for a rip-roaring yarn, not to mention a cast of characters that would give Buffy and Angel a run for their money, as well as a probably unhealthy dose of sexual tension and plenty of Hollywood-style politics. It's a good beach read, and Armstrong clearly has her fans; Jaime's adventures are reminiscent of early installments in the Anita Blake series. However, the story has a number of problems, most of which can be chalked up to lack of detail, or lack of the right kind of detail. No Humans Involved raises a number of interesting questions and implications, such as how supernaturals (which necromancers apparently are, despite possessing no other talents besides talking to the dead) deal with ordinary human beings, whether it's ethical for a person with real power to take part in a reality show with a couple of performers, whether necromancers should help the ghosts they raise because they possess the ability to do so, and whether it's all right for supernaturals in general to deal with a problem by killing it just because they can. Armstrong, however, only addresses these questions superficially, and it weakens Jaime's character substantially to have her pick up such interesting questions and then drop them in favor of getting to the next plot point. Although she presents herself as an independent, tough-minded woman, Jaime spends a great deal of the book needing to be rescued or to ask for help; especially, and most dissatisfactorily, at the novel's climax. (She also appears to be dating someone whose powers include a supernatural reserve of patience, a characteristic one wouldn't normally ascribe to werewolves.) Additionally, some threads of the plot—such as whether the show's producer is really trying to turn the cast against each other—are not so much left unresolved as abandoned. One can argue that the supernatural thriller/romance subgenre as a whole isn't intended to wrestle with deeper issues but only to provide some light entertainment. True enough. However, No Humans Involved too often reads as rushed, with passages of narrative summary right when readers would like some dramatization, and hints of depth of character and theme that ought to have been explored rather than glossed over. There are many intriguing sketches here, but the full-color picture never emerges. 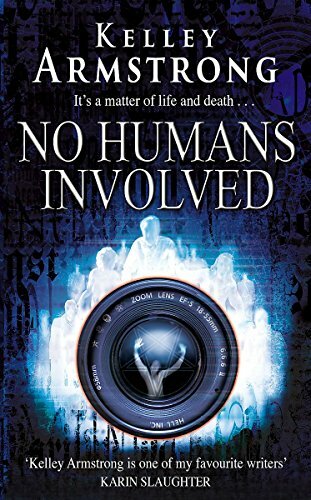 No Humans Involved is the seventh novel in Kelley Armstrong's Women of the Otherworld series, which features a supernatural world alongside and within our own. Several of the characters from her earlier novels recur, and the series structure of her fictional world is starting to become as ramshackle as that of Terry Pratchett's Discworld, whereby an initial concept branches out into a loosely related but not necessarily linear series. The novel opens with a homeless young man accompanying a couple of volunteer welfare workers back to their home, which doubles as a shelter. The couple are joined by a group, and they pour gasoline over him. The main story, however, starts on a Hollywood set, where Jaime Vegas, a spiritualist who can talk to the dead, unlike her showbiz peers, has joined two other telespiritualists for a reality show that seems like a cross between Big Brother and Most Haunted . But Jaime's is a talent that's more of a curse. Her grandmother, unable to cope with the continual whispering of ghosts, went insane. The ghosts always want something, a message passed on or their killer found or something else—whatever it is, they're always demanding. While the constant pleas from the dead are an irritation that could—if she allowed them to—consume Jaime, most ghosts can only talk to her. The real problem is the few who can touch her. The previous year, Jaime was attacked by the ghost of a vampire, who tried to bite her neck. So when she and her colleagues hold a practice séance and Jaime—pinched, prodded, and caught by surprise—accidentally upstages her peers, it is an event of some significance. Jaime works out that the ghosts are probably children and that they died by black magic. She determines to find out the truth and accompanied by Jeremy, a werewolf, starts to ask questions of a witch in Oregon. With the aid of the daughter of one of her dead friends, Jaime decides that the only way to lay the ghosts to rest is to raise them from the dead. But the gang who killed the young homeless man have heard that someone is nosing around and decide that they will use the interloper for their own purposes, leading to a battle between Jaime, Jeremy, and their friends and the gang. Armstrong has clearly done her homework on spiritualism and offers some interesting sidelights on the methods involved in telespiritualism and cold and warm readings. Additionally, Jaime's depiction of the bitchiness of the Hollywood lifestyle, while not original, felt realistic; indeed, the overall story would have benefited from that plot strand carrying on longer. There is one scene in which Armstrong shows what she's capable of when Jaime raises the dead—in this case the corpses of animals shot by hunters; there is one priceless moment involving half a raccoon mounted on a plaque—and while Jaime is on the location set, the book is reasonably interesting. The pace flags, however, when she turns detective, and there isn't enough originality to make No Humans Involved anything more than a beach read. It seems too much like a novelisation of a nonexistent television series. Characters from earlier novels—Paige, Eve, and Elena the werewolf—all make their cameos in order to keep their star's accreditation in Armstrong's cast, then promptly exit stage left when no longer needed. Jaime's diversion to Portland, then across the state border into Washington, feels arbitrary, despite Armstrong's rationalization that Jaime feels sidelined by the other, more experienced members of the "interracial committee" of supernaturals (vampires, werewolves, etc.) who seem—as far as a novice reader of Armstrong's work can tell from skimming Amazon's reviews—to be the protagonists of her earlier works. Jaime's trip is made in order to ask a stranger for information that she could have gotten from one of her existing contacts; perhaps because Jaime (and therefore the reader) is not allowed to know why her friend Eve is kept out of the way by the Fates, and because said diversion is built like a house of cards on this arbitrary withholding of information, this section of the book felt awkward, and worse, contrived. From the point of view of a new reader, while the main protagonists and the television characters are well drawn, the supporting cast felt sketchy. Of course, Armstrong faces a dilemma here: spend too much time telling new readers about Hope and the other protagonists of earlier books, and she not only slows down the story but also risks her regular readers switching off. (The answer, of course, is not to rely so much on recurring characters, but that's not the choice Armstrong makes.) But if the supporting cast are sketchy, where No Humans Involved really falls short is in its villains. There is a moment when, in talking about the yearning in the main antagonist's voice, Armstrong has the chance to make her villains more than two-dimensional sketches (the reader finishes the book with absolutely no idea what drives the baddies other than that They Are Evil), but she shies away from this as if her editors has whacked her across the nose. "She's a half-demon. That's what we call them. Demons take human form and impregnate women. The children look human, but they have special powers. The ability to control an element, or improved senses or—"
No Humans Involved isn't a bad book—far from it. But it isn't a good book either, and I felt it had the potential to be one. It's just . . . shelf filler. This is regrettable, because whatever the earlier books were like, No Humans Involved doesn't quite have enough originality to make it worth buying the others for their ideas, nor does Armstrong's characterization make it worth hunting out her other books. No doubt it will sell well to Armstrong's many fans, and perhaps make her some new ones. But when a couple of thousand books are published annually, No Humans Involved is not going to be one of the year's memorable reads. Colin Harvey is the author of the novels Vengeance , Lightning Days , and The Silk Palace (due out in September). He is currently working on Blind Faith , a thriller with the slightest speculative twist, set in Brighton in July 2005. He also has a day job, but it’s not very interesting. Colin Harvey’s latest book is Winter Song .